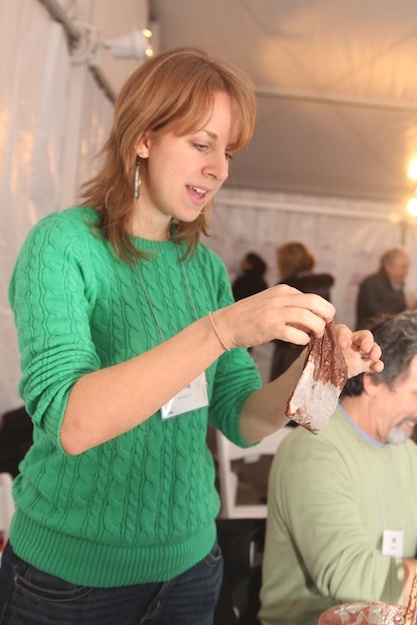 I’m still abuzz from all of the new experiences I had last weekend at the Hazon Food Conference. Over the course of four jampacked days, I met passionate, articulate and inspiring food, social and environmental activists, Rabbis, educators and students, chefs and home cooks, gardeners, farmers and food producers, writers and filmmakers. A lofty and inspiring mission, for sure. 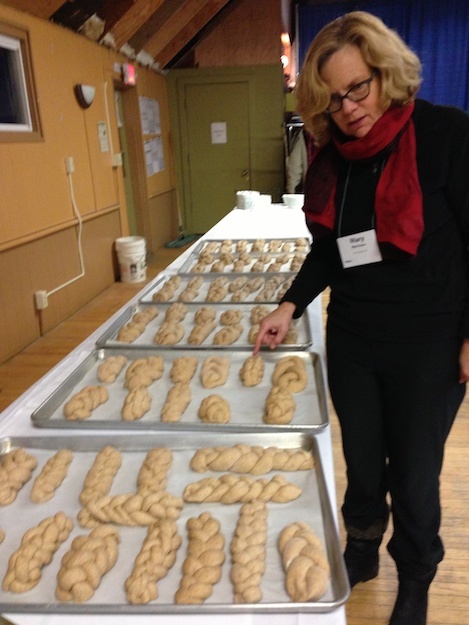 With 260 participants attending, we bonded over shared experiences, like gathering after dinner on the first night to braid 144 loaves of challah for Shabbat the next evening. How to divide up the deep vat of organic and whole wheat dough that had been mixed in the kitchen? 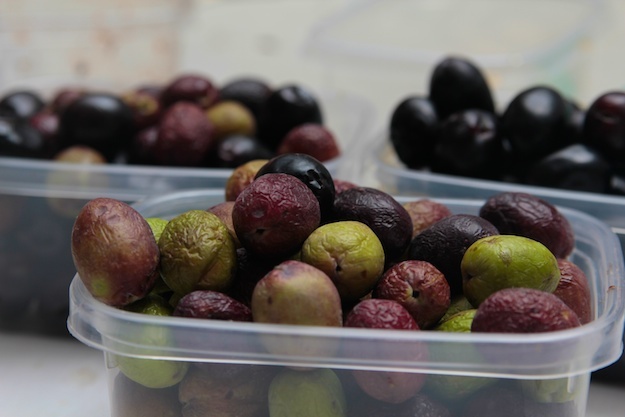 We pressed olives to extract their oils in order to experience the labor and miracle of oil production as we were about to celebrate Chanukah the next evening. 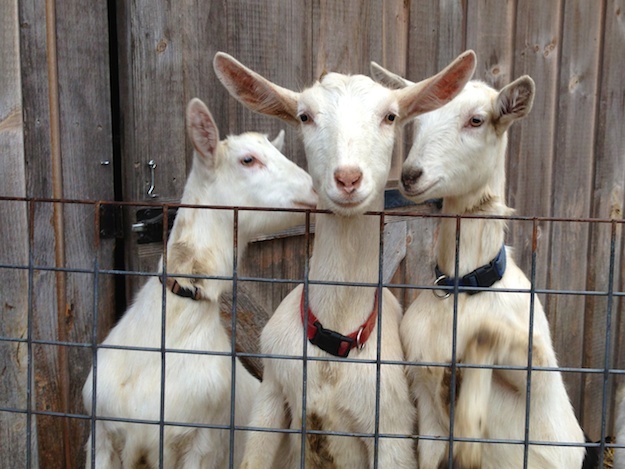 We headed down to the goats’ pasture each morning to watch the Adamah fellows milking the females. 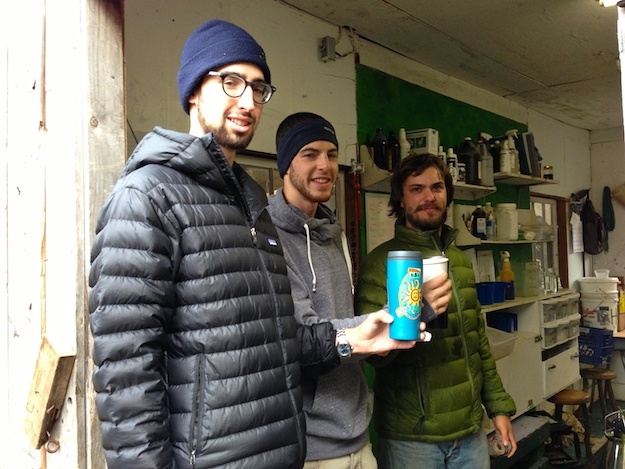 We brought along steaming mugs of black coffee to lighten with fresh, hot milk. The path from goat to goatgurt is a direct one. 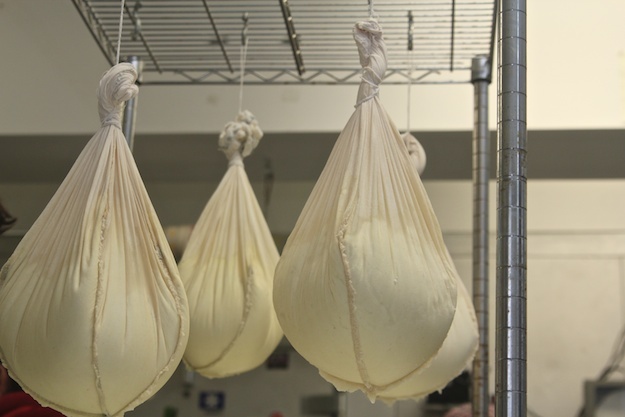 Feta and “Holy Chevre” are made on site with milk from the farm’s goats. 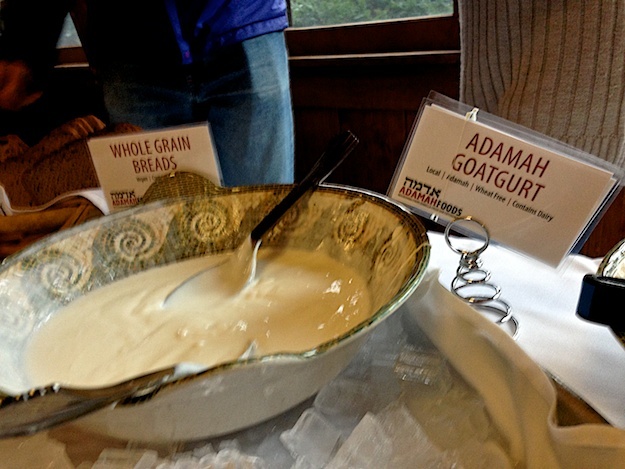 “Goatgurt”, the farm’s nutritious and bright yogurt, was served with breakfast each morning. It tasted clean, a tad tart and grassy. Talk about farm to table! 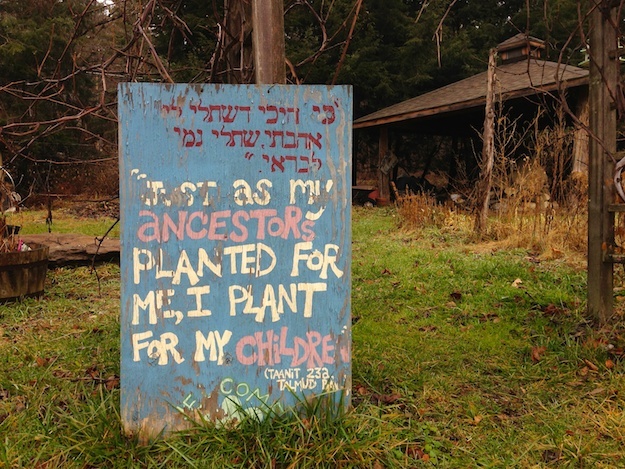 The Adamah farm created a value- added program to help support their farming and educational efforts by growing all of the ingredients for their line of kosher, organic, lacto-fermented and preserved products. Season-extending methods are employed by using greenhouses and hoop-house growing. The pickling, freezing, canning and drying efforts have brought kimchi, crunchy pickles, and snappy sauerkraut to the table. 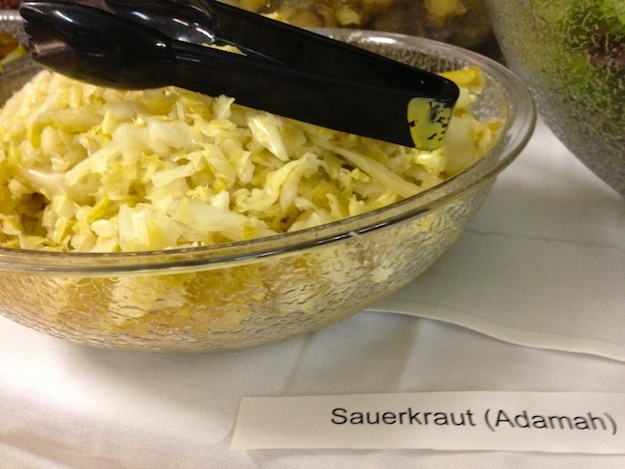 Over the course of sharing nine meals and numerous snacks with other participants, I eagerly read the informative and inspiring labels placed by each dish on the buffet tables. Ingredients were listed for those with restrictions. Farm sources was noted. With many ingredients coming from the on-site farm or other neighboring farms, we enjoyed lots of frost -sweetened sauteed kale and collards, braises with plenty of onions, and loads of reddish yellow kabocha, and naturally sweet butternut and delicata squash. 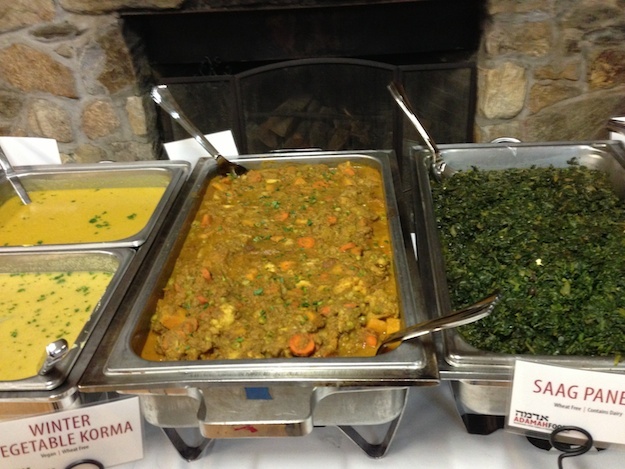 We were welcomed to the opening night dinner by a vegetarian, Indian themed feast. The collard greens had been picked early that week and feta from the farm’s goats combined to make a spicy and nutrient packed Sag Paneer. Golden, folded samosas included spuds from a neighboring farm and desserts throughout the weekend were simple, homestyle trays of moist honey cake , pumpkin bread and apple crisp. 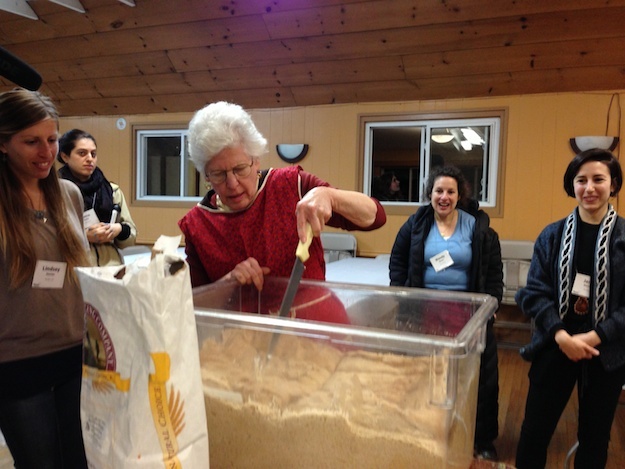 And because we arrived before Chanukah and celebrated the beginning of our eight day holiday as a new community, there was a hands-on cooking session taught by Leah Koenig, author of the fascinating and user friendly cookbook, The Hadassah Everyday Cookbook. Koenig’s collection of recipes span the culinary globe including Mexican, Asian, French, Middle Eastern and Italian inspired dishes. 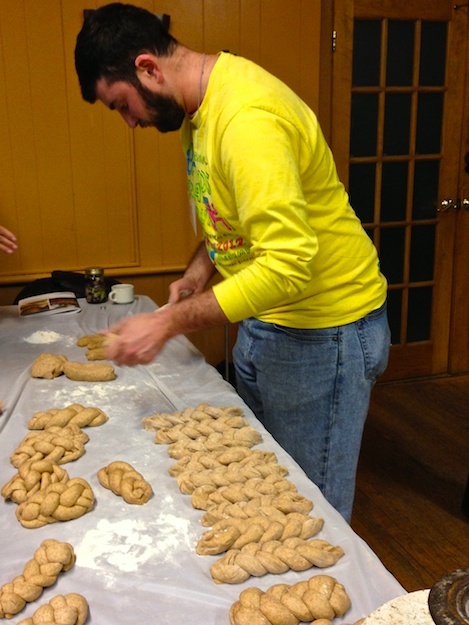 In honor of Chanukah, when we get creative with all things fried, Koenig taught us how to make Bukharian potato turnovers. 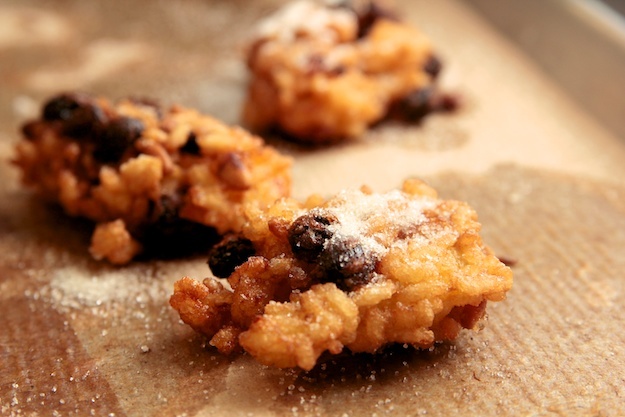 My favorite new dish is the Italian Rice Fritters (Frittelle de Riso per Hanukkah). Enjoy this sweet and citrusy twist on more familiar American fried treats. Scroll down to check out this easy recipe. 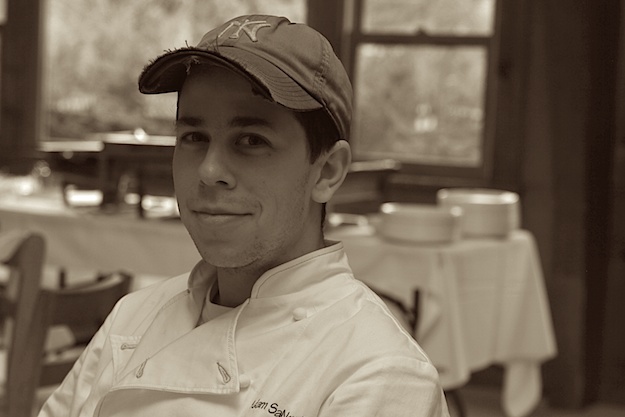 And a HUGE thank you to Chef Adam SaNogueira who masterfully cooked 2250 servings for our appreciative and passionate group of Kosher foodies over the course of nine meals, multiple and much appreciated late afternoon snacks and Chanukah treats. I gained deeper insight into the process of growing, planning, sourcing and preparing farm to table meals as a result of sharing some precious quiet moments with him as he was winding down towards the end of the conference. To learn more about where you can buy Adamah’s cheeses, pickled veggies and sweet jams, click here. In a medium saucepan, bring the water and salt to a boil. Add the rice, cover, reduce heat to low and simmer until rice is tender and has absorbed the water, about 25 minutes. While the rice cools, soak the raisins in warm water to cover. Drain well. In a deep, heavy skillet or saucepan, heat at least 1 inch of oil over mediumheat until it reaches 350 degrees. While the oil is heating, transfer the rice to a medium bowl and stir in the eggs, nuts, zest, vanilla and orange blossom water. Working in batches, carefully drop the batter by heaping tablespoonfuls into the oil. Press lightly with the back of the spoon to flatten slightly. Fry, turning once, until golden brown on all sides, about 2 minutes per side. 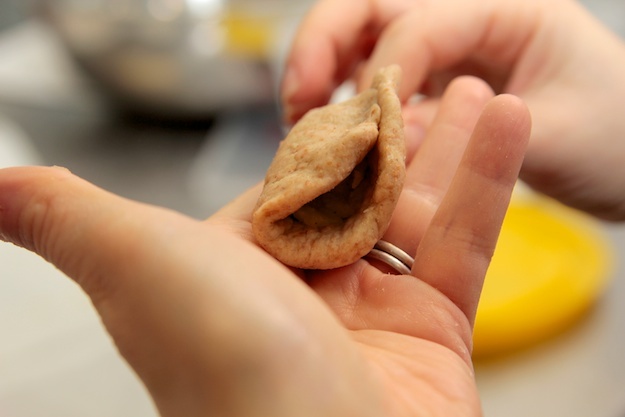 Using a slotted spoon or tongs, remove the fritter, drain on paper towels. Serve sprinkled with sugar or drizzled with honey. Great post and beautiful pics. Looks like an awesome time. Glad the pics helped to tell the story. 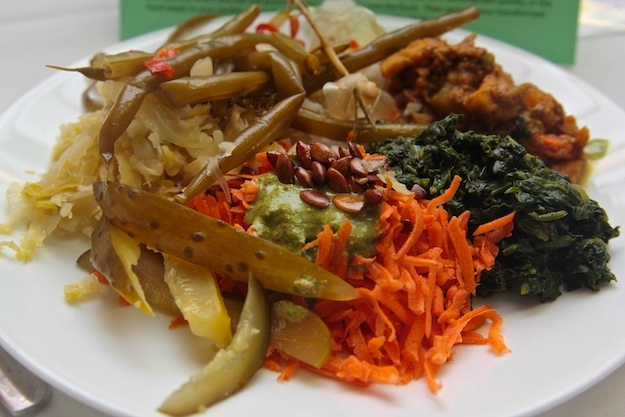 The Hazon Food Conference was an inspiration to me in many ways. Liz thanks for the beautiful post, you painted a wonderful picture of a fascinating and fun few days! What’s missing, of course, is the Shabbat experience during the conference. It was truly peaceful and inspiring. Glad you liked the pics and the telling of the story. And what a great ice-breaker, too! Kudos to Gayle Squires,http://koshercamembert.com/ for figuring out how to divide up that much dough evenly into 144 loaves!It must be the scientist in her. Double YAY for Challah braiding! 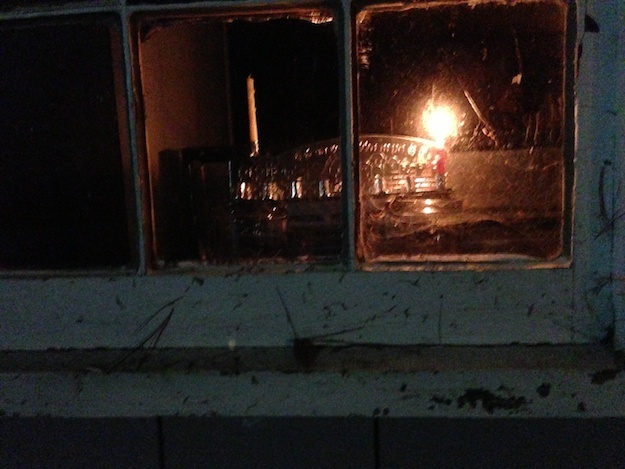 Meant to have this all in one comment – oops! Liz – and all my new friends – it was so wonderful to meet, eat, cook and learn with you all! Shabbat Shalom, Y’all! Happy to share Hazon’s vision and my experience of it. 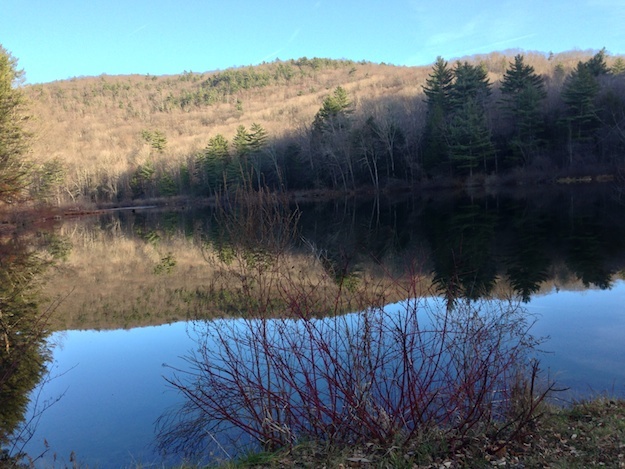 Thanks for the recap – I made it to the Hazon conference last year and hope to make it next year. Love the recipe too – thanks for sharing! Would love to meet you next time! Keep on reading…. Glad to see you made it up to Isabella Freedman center! They have great food, events, facilities, and people with a wealth of knowledge. SO glad you are familiar with their vision and remarkable work!